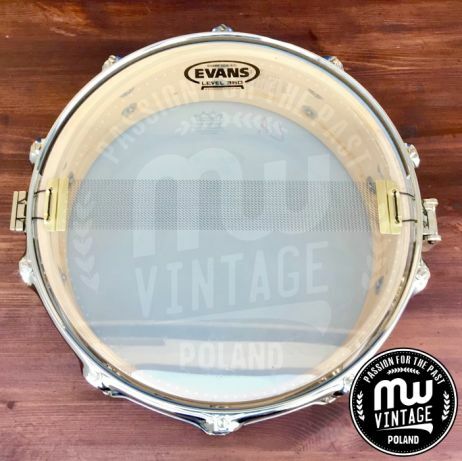 It was late spring of last year when we locked ourselves away at Perlazza Studio (based in Poznań, Poland), where we tested quite a number of vintage drum kits and snares provided by Mateusz Wysocki and his MW-Vintage company, which (as the name suggests) specializes in vintage drums. We performed the test under the sonic supervision of musician, award-winning producer, studio owner and, most of all, a drum maniac, Przemysław Wejmann. To be more exact, it was drummer Max Psuja, who tested all the gear while the beatit.tv team recorded the video and the sound engineer/producer took care of the sonic side of things. 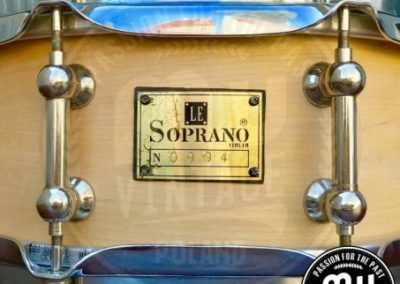 Le Soprano is an Italian manufacturer who builds high-end drum kits and snare drums according to traditional methods of Italian master woodworkers, using traditional materials and hardware. 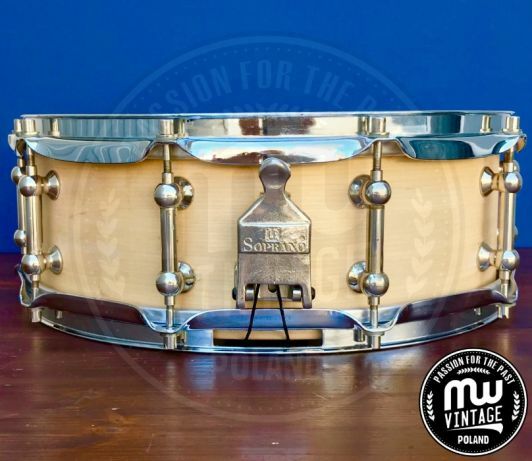 The shell of the snare drum tested here was made from North American maple. 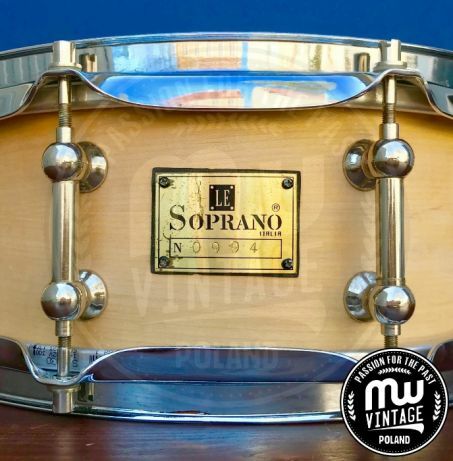 According to Mateusz Wysocki, this Le Soprano New Vintage Maple snare was manufactured in 1999. 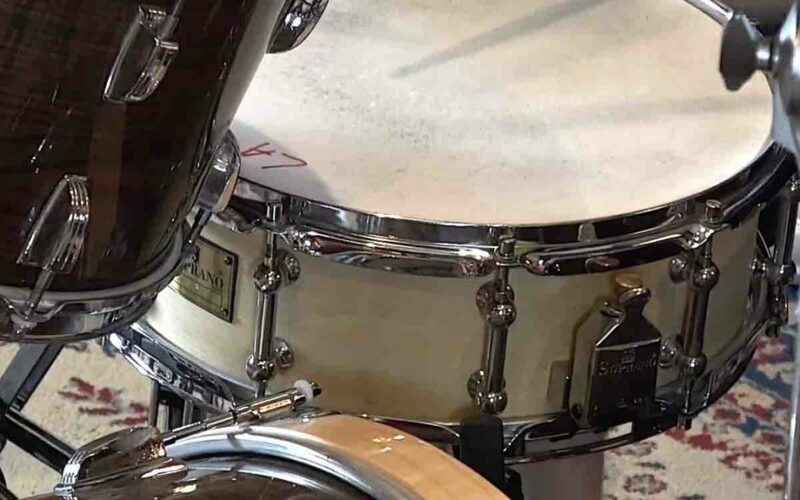 When testing the Le Soprano New Vintage Maple 14″ x 5″, we also used a 1966 Ludwig Super Classic drum kit, Impression cymbals and Aquarian heads (Response 2 Coated on the toms, Texture Coated and Classic Clear on the snare as well as Super Kick I Coated on the bass drum). 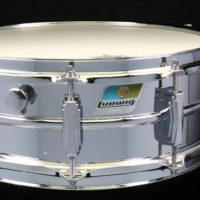 The snare drum sounds very warm, rather bright, and with a significant amount of that “classic” sonic characteristic. It also offers a rich palette of tones. There isn’t very much of the tinny and slightly choked sound, which is so frequent with vintage snares. It is very responsive to stroke at almost all levels of dynamics. Right, almost all. 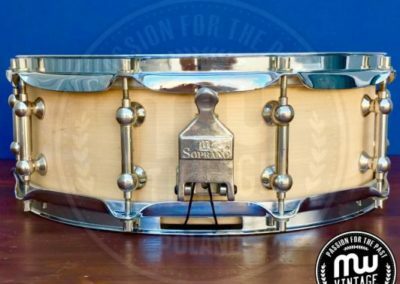 Having gone above a certain level of forte (and tried to achieve something in the region of “super mega nuclear” forte), the player will not be able to squeeze any more dynamics out of the instrument, which is generally characteristic of many vintage snare drums. However, it is not a fault. The instrument requires a certain level of precision when hitting it as even a slight movement of the stick in any direction influences the pitch. Le Soprano instruments certainly belong to those worth drummers’ attention. Both the sound and the finish are classically beautiful. Drummers playing jazz, pop, blues, alternative rock or prog rock (especially in the classic meaning of the term) should be more than satisfied. This is what Max Psuja had to say about this kit: “The Le Soprano New Vintage Maple is a wonderfully crafted and beautiful-sounding snare. It’s got a lot of warmth and brightness to the sound, it’s very open, with a wide range of tuning possibilities. I think the instrument will deliver in such genres as jazz, softer kinds of rock and alternative music”. Drummers and Drummerettes! 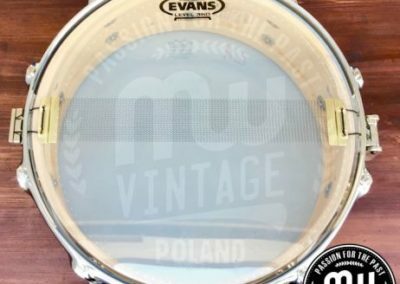 It’s time to put the Le Soprano New Vintage Maple 14″ x 5″ snare drum to the most important test of all, i. e. the en.beatit.tv viewers’ test! Exclusively for you, we give you Max Psuja!